Guatemala City is the capital and largest city in Guatemala with about 1.3 million people living in the city proper but probably around 3.5 million people live in the greater metropolitan area, making it one of the bigger cities in Central America. The city is located in the central southern part of the country on an elevation of about 1,500 metres, surrounded by high mountains and volcanoes, which gives it a rather mild climate. It's the economic heart of the country and together with Antigua (the former capital) it also has a lot to offer culture-wise. Most people flying into the country arrive here and spend at least a few days here before moving on. The city is threatened by earthquakes, mudslides and volcanoes, with the first killing thousands of people during the last century as well as damaging and destroying lots of buildings. The historical centre remains beautiful though and a visit to the city should start here. Guetemala City has a very pleasant climate, with generally slightly lower temperatures and humidity compared to areas at lower altitudes. The wet season lasts from May to November, like most of Central America. The coolest months are December to February, the hottest April and May. Temperatures vary from 12 °C on average at night in January to 29 °C on average during the day in the month of May. La Aurora International Airport (GUA), located 6 kilometres outside Guatemala City, does not only serve the city but is also the main gateway to the country. TACA has flights to Cancun, Chicago, Los Angeles, Mexico City, Miami, New York, San José in Costa Rica, San Pedro Sula in Honduras, San Salvador, Tegucigalpa and Washington, D.C.. Several other destinations are mostly within Central America or the United States. Iberia is the only European carrier that has direct flights from Madrid to the city. Transportes Aereos Guatemaltecos has several domestic flights, from Guatemala City to Flores and charters to a few other destinations, like Zacapa and Puerto Barrios. Litegua has connections between Guatemala City, Rio Dulce, Morales, Puerto Barrios and many other towns and cities. Recently, Guatemala Municipality has established a system of buses called "Transurbano" (blue& white) and "Trasmetro" (green) which is the closest thing to a 'Metro' but by a long articulated bus using a dedicated lane along the streets. To use this system you have to buy a pre-paid card in various places of the city, and there is a special card for tourists as cash is not accepted on board. You can also also pay with Q1 coins to the machines at the stations for the "Transmetro". Routes and stops are predefined and each trip costs Q1. There are transfer points in some places and they can reach almost any area of the capital city with this system. This system is constantly growing and is much safer than the traditional red city buses, with police surveillance, security cameras, panic button, GPS. You can check the routes and stops on the system websites for Transurbano and Transmetro. Most of central Guatemala City can easily be explored on foot. Though a little risky, there are great street vendors that offer a variety of good local foods. Just remember to scope out the one with the best hygiene. 4 Grados Norte. A cultural district in Zona 4 in Guatemala City. It was a project of the municipality to convert this area into an attractive pedestrian area in 2002. Many green areas were created. Today the district also features bars, restaurants, shopping and cultural activities and has become one of the city's trendy and open minded areas, competing with Zona Viva in Zona 10. The most interesting places are perhaps the ones just outside the main street. More recently has become less popular and developed a poor reputation. El Portal, inside the complex (entrances from 8 Calle, 9 Calle and 6 Avenida) facing Parque Central, Zona 1. Supposedly Che Guevaras favorite place when he lived in Guatemala City in the early 1950s. ONE Restaurant+Lounge, 14 Calle 4-74, Zona 10, ☎ +502 2368-0724, +502 2337-3903. ONE is a contemporary restaurant and lounge with an avant-garde design. 25% off from 4PM through 8PM, Monday through Friday. Wednesday and Saturday is Ladies' Night with 2x1. For RSVP: +502 5736-6117. Main dish Q70-190. Most accommodations in the Zona Viva are within a few blocks making location less important than amenities like airport transfers or breakfast. Check for hidden costs and taxes (22%) before booking. Hostal GuateFriends, 16 Calle 7-40, Zona 13. Aurora 1, ☎ +502 2261-3460. Check-in: 3PM, check-out: 1PM. In Zona 13, one minute from La Aurora International Airport, safe, private parking, affordable, breakfast, lunch and dinner, international foods prepared. Breakfast served 07:00-10:00 From US$18 per person in shared rooms and US$35-40 p/p in private rooms. Pension Meza, 10 Calle 10-17, Zona 1, ☎ +502 2230-1233. In Zona 1, near the Parque Central, safe, cheap, basic. From US$4 p/p in shared rooms and $8 p/p in private rooms. Dos Lunas Guest House, 21 Calle 10-92, Zona 13, fax: +502 2261-4248, e-mail: info@hoteldoslunas.com. Free services included: airport transfer to or from La Aurora airport, breakfast and WiFi internet. Close to the airport. Dorms and privates from US$14 p/p..
Hostal Hermano Pedro, 6a Avenida 20-53, Zona 13, ☎ +502 2261-4181, e-mail: infogt@hhpedro.com. Free services included :airport transfer to or from La Aurora airport, breakfast and WiFi internet. Dorms and private from US$17 p/p. Close to the airport. Hostal Los Volcanes, 16 calle 8-00, Zona 13 Aurora, ☎ +502 2261-3040, +502 2261-3584, +502 5853-7016, e-mail: info@hostellosvolcanes.com. It is 600 m from airport La Aurora. Dorms and privates from US$15 p/p. Hotel Spring, 8 Avenida 12-65, Zona 1, ☎ +502 232-2858. Double room US$22. English spoken. Situated in the colonial house, it has a nice cafeteria in the courtyard. But one annoying thing is that the entrance to the bathroom is very low, expect to bang your head at least once. It also provides internet access, but the prices are a bit steep. Apart from that clean and pleasant. Quetzalroo Backpackers, 6ta Avenida 7-84 zona 10, ☎ +502 5746-0830. A hostel in the financial district (near the airport). It is easy to find, as it's neighbors with the McDonald's in Zona 10. The atmosphere has the laid-back Aussie aspects from Jodie and the local knowledge of Manuel, who are the owners. The rooms go for dorm US$15; Single US$20; Double US$35. Hilton Garden Inn, 13 Calle 7-65, Zona 9, ☎ +502 2423-0909, fax: +502 2334-4546, e-mail: staying@hotelesprincess.com. Check-in: 3PM, check-out: 1PM. One mile from Aurora international airport. Free shuttle. From US$89. Best Western Stofella, 2 Avenida 12-28, Zona 10, ☎ +502 24108600. In the heart of Zona 10. Continental breakfast included. From US$66. Comfort Hostel, 17 Calle 14-35 Zona 10, ☎ +502 2367-0754, +502 2367-0755, e-mail: info@comforthostel.com. 10 minutes to the airport, and 5 minutes to Zona Viva. Ciudad Vieja, 8 Calle 3-67, Zona 10, ☎ +502 2210-7900, fax: +502 2331-9104, e-mail: info@hotelciudadvieja.com. Doubles from $69 + taxes with continental breakfast and one free hour internet. Hotel Pan American, 9a Calle 5-63, Zona 1, ☎ +502 2244-0850, fax: +502 2232-6402, e-mail: panamhot@terra.com.gt. Doubles from US$60. Beautiful old hotel with decorations from around Guatemala. Nice restaurant with waiters dressed in traditional costumes. Barceló Guatemala City, 7 Avenida 15-49, Zona 9, ☎ +502 2378-4000, e-mail: guatemalacity@barcelo.com. Check-in: 3PM, check-out: noon. In an early booking you can get rates from US$109 for a double. The hotel is set right in the heart of the city, in the main business district. Holiday Inn, 1 Avenida 13-22, Zona 10, ☎ +502 2421-0000. Check-in: 3PM, check-out: noon. Rates from US$100 in advance purchase. Westin Camino Real, 14a Calle 0-20, Zona 10 (Avenida la Reforma y 14 Calle), ☎ +502 2333-3000, e-mail: reservaciones@caminoreal.com.gt. Check-in: 3PM, check-out: 1PM. Rates from US$120. Real InterContinental Guatemala, 14 calle 2-51, zona 10. Ciudad de Guatemala, 01010. Guatemala, ☎ +502 2413-4444, fax: +502 2413-4445. Offers 160 total rooms, 48 rooms club Intercontinental, 24 business room, 6 junior suites and 1 Presidential Suite, Rooms for disabled and InterContinental Ambassador floor. In their space features 3 restaurants, gymnasia, spa, jacuzzi and pool. US$100-400. Crowne Plaza Hotel, Avenida de la Americas 9-08 Zona 13, ☎ +502 2422-5050, fax: +502 2422-5001. Double rooms from US$95. Uxlabil, 15 Calle final, Oakland, Zona 10. For those planning a longer stay in the city. Differently sized (mostly small) apartments with kitchen. Cleaning service included. Internet connection in the reception. Washing machine. Around $600 per month (shorter stays also possible). If English is your native language (with Spanish as your second language), you might find work as a private English tutor or translator. Look at the classifieds in Prensa Libre. 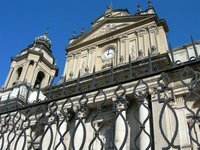 We have a comprehensive list of accommodation in Guatemala City searchable right here on Travellerspoint. You can use our map to quickly compare budget, mid-range or top of the range accommodation in Guatemala City and areas nearby. This is version 27. Last edited at 8:15 on Aug 7, 18 by Utrecht. 23 articles link to this page.